Healthwatch Dudley is part of Age Alliance in Dudley, an informal partnership which brings together older people and supporting organisations. 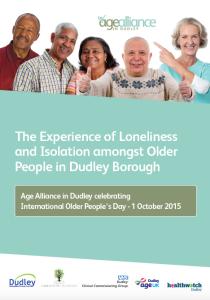 Last summer the alliance worked together to listen to older people’s views about loneliness and isolation. Healthwatch Dudley staff and volunteers supported by helping to complete over 450 surveys in supermarkets and town centres. We asked questions about people’s direct experiences of loneliness, isolation and their knowledge of services that offer support. The work was presented at a conference at Brierley Hill Civic Hall on National Older People’s Day last October, where decision makers listened to older people and made a commitment to including the learning in future work plans. Following the conference a report has been produced which includes recommendations around better promotion of preventative services, support for carers, communication, bereavement support and the need for more intergenerational work. This is an important piece of work for Healthwatch Dudley to be involved with as local people’s views and experiences have sat at the heart of the process. We would like to say a big thank you to our volunteers and to Dudley College health and social care students, for supporting us to be involved so fully, from carrying out interviews, to ensuring the data was entered quickly and accurately. We would also like recognise the time and energy that fellow members of Age Alliance, many who are volunteers themselves, have given to leading on this research. We are delighted to share the full report ahead of its official launch in February by the Mayor of Dudley which can be downloaded here. This entry was posted in Uncategorized on January 20, 2016 by Healthwatch Dudley.